We had both a personal and professional interest in the health and wellness sector before we ever heard about Massage Addict. When we learned—from watching CBC’s Dragons’ Den—that the business was founded and had achieved its initial success right here in Halifax, our curiosity was piqued. We immediately started to consider becoming franchisees ourselves. One e-mail and one coffee with the CEO later, we were on our way to becoming multi-unit owners. I am originally from Maplewood, N.S., which is about 30 minutes away from Mahone Bay and Lunenburg and 45 minutes from Bridgewater. I have two younger sisters, one of whom is now an electrical engineering technician in Espanola, Ont., while the other is a pharmacy technician in Edmonton. Our father worked in forestry and as a school bus driver, while our equally hardworking stay-at-home mother babysat other children after school, volunteered in the community, made home-baked goods and grew our vegetables. As a child, I loved being outside. I enjoyed cross-country skiing, skating on the pond and playing softball and basketball. I was involved in the local 4-H club from a young age until I graduated from high school. I was active in my school and became student council president in my senior year of high school. I honestly had no idea what I wanted to be when I grew up. I spent a lot of time talking with the high school guidance counsellor. I decided to go to Acadia University in Wolfville, N.S., to study sociology and psychology, which whetted my thirst for knowledge and my curiosity about people around me. When I finished my bachelor’s degree, I was unsure how and where I wanted to apply my knowledge of and interest in people. I worked in retail sales for a bit, then as a manager at Dooly’s, a Canadian billiards franchise system with locations in Halifax. While I wasn’t the franchisee myself, I was given the freedom as manager to operate it as my own business. That experience sparked my interest in becoming a business owner, as I quickly learned about both the complexity of running a business and how its success is contingent on talented, inspired people working on the front lines as the face of the organization. It became clear to me how I could use my sociology and psychology background creatively in a business environment. 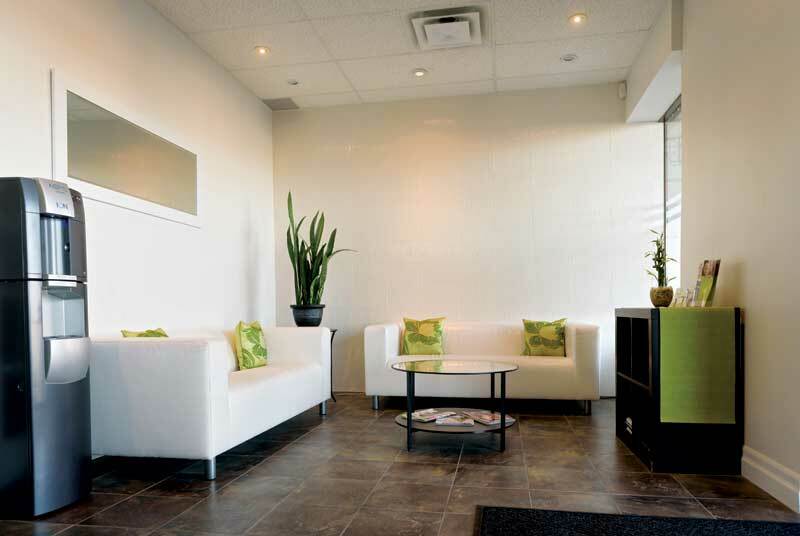 One of the first things that impressed us about Massage Addict was how clean and professional the facilities were. I moved on to the non-profit sector next, working for a number of charitable organizations in a fundraising capacity. By managing senior teams of volunteers and staff, I further honed my people management and business skills. I worked as the executive director of a foundation in Halifax called Laing House, which supported at-risk youth suffering from mental illnesses, up until our son Garret was born in late 2010, then returned for about six months after my maternity leave. I am from Saint John, N.B. My father was a letter carrier and my mother worked at the Royal Bank of Canada (RBC) as a branch administrative manager. I have an older sister, Shelley, who has run her own business and is now working with a real estate company. When I was a kid, sports were my life. I played hockey, baseball, lacrosse and golf and I loved all of them.